Many New Yorkers complain about their views—or lack thereof—while gazing outside their apartment windows. If you think staring at a brick wall or your neighbor walking around with no shirt on is bad, imagine looking out your apartment window at a giant rock. Sandwiched amid two apartment buildings on West 114th Street and Broadway in the Morningside Heights neighborhood of Manhattan sits an enormous boulder. Approximately 30 feet high by 100 feet long, this boulder is comprised of Manhattan schist, a prominent strong and durable rock type that comprises part of the geologic foundation that New York City’s subway system and busy streets rest upon. 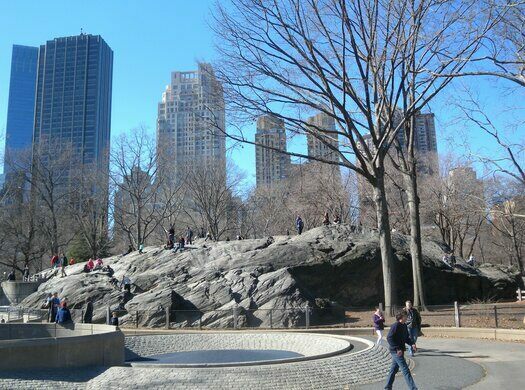 The boulder is known to locals as Rat Rock (also the name of a large piece of schist in Central Park) due to the frequent rats nesting and congregating nearby. Manhattan schist, which can be seen in areas including Morningside Heights, Central Park, and Marcus Garvey Memorial Park, is vital to the topography and layout of New York City. Skyscrapers and taller buildings are more prevalent in areas where the schist is closer to the surface; it exists 18 feet below the surface in Times Square, for example, while an area like Greenwich Village where the schist is more than 250 feet below the surface doesn’t have many tall buildings. 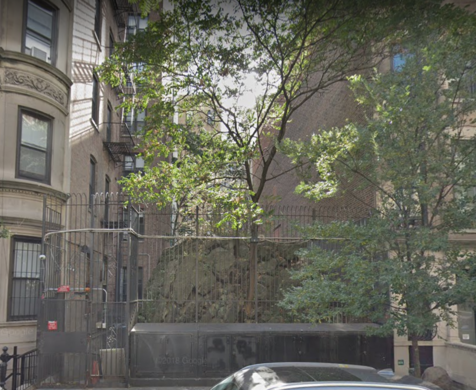 Located between 600 and 604 W. 114th St. and Broadway, the giant Manhattan schist boulder is sandwiched between two apartment buildings so be respectful of the local residents. The boulder is also protected by an iron fence to prevent vandals. The church's three resident peacocks now have their own Gothic-style abode.